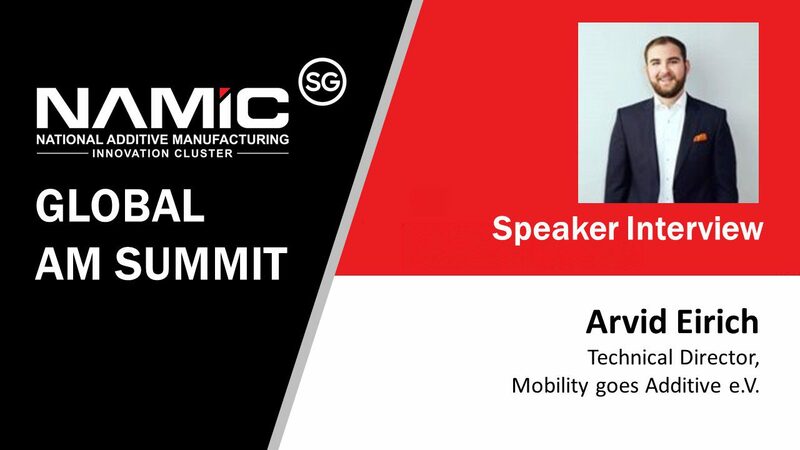 Interview with Arvid Eirich – Technical Director, Mobility goes Additive e.V. In the past and today, Deutsche Bahn AG (DB), as the largest mobility and logistics service provider, has faced new challenges. Growing competitive pressure between rail and road, innovations such as autonomous driving and increased ownership sharing had a negative impact on the Group’s results. In addition to restructuring and internationalization initiatives, Deutsche Bahn has therefore placed an emphasis on digitization with its “Future Railway” corporate transformation program. Digitization is seen as an opportunity and a key role for the future of the Group and various Group programs have been initiated. One of these projects is 3D printing, which will support the digitization of the production environment of Deutsche Bahn. Due to a shift in performance in the maintenance of rail vehicles, 3D printing, among other things, is of great importance for the DB Vehicle Maintenance business unit, which carries out the heavy maintenance of rail vehicles and wagons of Deutsche Bahn. The challenges in digitizing the production environment are enormous. Deutsche Bahn and rail transport in Germany have a centuries-old historical background. The 4 industrial revolutions are reflected in the daily routine of the group. Currently, manually operated signal boxes, which mechanically change the track, are in operation at the same time as the new fully automated electronic signal boxes during digitization. But even the vehicles, some of which have been in operation for more than 40 years, have requirements from digitalisation, some of which the new ICE 4 already brings along. The simultaneous smooth and compatible operation of this old and new technology brings with it a wide variety of problems in the areas involved. The disruptive power of new business models, such as the long-distance bus market in the transport business or autonomous driving on the road, are forcing the various business areas of Deutsche Bahn to become better and faster. Against this background and the promising technology of 3D printing, the DB Group project “3D Printing” was initiated at Deutsche Bahn in mid-2015. An interdisciplinary team from all business areas of DB develops the basis for the use of 3D printing in the Group and checks which applications are suitable for the use of the technology within the Group company. DB sees the potential of 3D printing in increasing the availability of spare parts and thus reducing unplanned downtimes. This minimizes downtime costs and contractual penalties for services not rendered and make it possible to offer competitive prices on the market. Improved availability of spare parts can ultimately reduce waiting times and increase customer satisfaction. As the initiator of the Mobility goes Additive e.V. network, DB has set its sights on the spear spice of additive movement in Europe and now manufactures over 5000 additive components. The challenges of implementing a new technology were mastered together with professional partners from the network and the increase in knowledge was shared with the industry. There are many examples that can be mentioned. Be it the individualisation of consumer parts or the avoidance of transport routes through “production” at home. In my opinion, however, the biggest impact can be found in the medicine and health industry. Be it individual hip implants, skull plates, hearing aids or simply individual models for the preparation of an operation. I think that we can significantly improve people’s health and lifespan through 3D printing, as increasingly complex procedures become possible and organs may soon come out of 3D printing. I think 3D printing is finding its way into more products. Product life cycles are becoming shorter and shorter and the desire for more individuality is growing. 3D printing will become more and more interesting for smaller series and thus spill over from the industry into the consumer area. Machines will become more productive and the variety of materials will grow. Hopefully in the next 5 years the challenge of post-processing will be committed. As digitized as additive manufacturing is, as laborious and industry 1.0 is the post-processing of components. 4) What new business opportunities, can we look forward to in Industry 4.0, especially in your industry? Industry 4.0 means for us the complete change of the business model. In the past we sold a service to our customer which could not be individualized. (Transport from A to B at certain times). With Big Data, sensors and Internet of Things we can get to know our customers better and offer them their personal services, as we can offer them individually through intelligent planning. Our asset also becomes more intelligent, so that we can carry out condition-based maintenance and servicing on the one hand and prepare our infrastructure for autonomous driving on the other. 5) From your experience, what are the limitations/roadblocks for companies using Additive Manufacturing and what advise will you give to startups wanting jump on the bandwagon? From our almost 5 years of experience in the application of additive technology, one thing can be noted: Additive manufacturing is so well developed that it can be integrated into existing production processes. However, the fact that this has not yet been fully achieved is due to the acceptance of new technologies and the willingness to change within the organisation. The confidence for additively manufactured components is still quite low in many areas. This is partly due to the relatively low level of awareness of 3D printing technology and the associated possibilities. In addition, many employees still lack the training or know-how to understand the technology and the new design possibilities. Additive manufacturing continues to be seen mainly as a prototyping production method and, according to some, is therefore not able to produce usable components. The users of this technology still needed support in demonstrating the possibilities of this technology and in its implementation in existing processes. Another obstacle is that a good data situation is a prerequisite for the identification of components. However, this is often not the case where companies need support in digitizing components. When it comes to hardware, the machines themselves must become more productive. Although the automated production process may be nice, the manual post-processing of components is very laborious. 6) Is 3D Printing the game changer for the Industrial revolution 4.0 and is it here to stay for the long haul? It is not the game changer, but it is an important tool that combines different Industry 4.0 technologies and can display them vividly. 3D printing will become one of the conventional production methods and its field of application will become established in certain applications.